There is peace in the morning. True, the sun has been up for many hours by now. True, the dark of night never really came after sunset here just shy of 65º north of the equator. The world slumbered in the twilight, though, and it hasn't fully awoken yet. Out in the fields, breakfast is under way for Canada geese and Sandhill cranes. They were resting last night when I was here, back when the noise of a Fairbanks summer evening filled the air. Now in the quiet they graze in the grass, enjoying the privacy of field fenced off from humans. Creamer's Field is a state refuge for migrating waterfowl. This land was once the largest dairy in Alaska's interior, and its open fields and wetlands attracted birds as they moved north with the summer. Active farming continues today in a continuing effort to attract birds. Alaska may seem like an endless wilderness, but in cities like Fairbanks these habitats are very beneficial for healthy populations of birds that spend part of their year in the land of the midnight sun. Take, for example, the bird I'm trying to photograph in the trees right now. It is restless, active, and agile. It knows I'm here and is making me work for a view. Diving behind leaves and branches, it occasionally lights, for only a second, in plain sight. 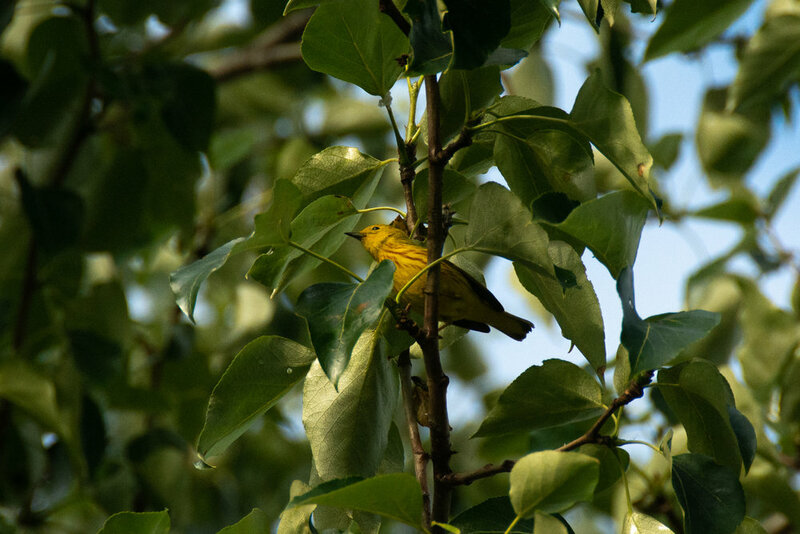 Thus, I am granted fleeting glimpses of this yellow warbler. The ruddy streaks down its breast and black marks on the wings are outshined by the vibrant yellow that covers the rest of this beautiful little bird. Piercing black eyes gaze back at me for a moment, and then they are gone. It was a tall order for me to arrive at this spot. There was the drive from Bend to Redmond, then the flight to Seattle followed by another to Anchorage. From there it was a long drive up the Parks Highway into Fairbanks capped off with a quick jaunt across the China River from where we're staying to where I stand. The yellow warbler laughs at ease of my trip. He has a better story to tell. Four months ago, he was in Mexico. That's where he spends a good portion of his time, taking advantage of the warmer weather and relative abundance of food. But each spring he knows that there's a better place up north. In April, perhaps, he started flying this way, secure in the knowledge that long, warm days lay ahead, along with all the insects he and his offspring could eat. For a solid month he traveled. Many suitable places were passed en route, but they weren't suitable enough. He wouldn't stop til the Alaska Range was south of him. Something drew him here to his breeding grounds. Maybe we'll never understand precisely what. Maybe he doesn't either. No matter what, though, he has easily more than doubled the distance I traveled to arrive at this same spot. And he beat me here. And he did it all with his tidy seven-inch wingspan. Patience is his price for a view, but he charges nothing for a song. He's got to out-sing the other members of his species that have arrived here, after all. His songs may number in the thousands today. The dozens I am treated to are not meant for me, but I enjoy them nonetheless. The world is more awake now. There are more cars driving by and more sunlight spills into the fields, but the morning ritual carries on unaltered here. The cranes are still wandering out there. The swallows are still chattering in flight. And the yellow warbler sings on, thanking the Alaskan summer for all it has given him just as I thank him for his song.